Enjoy the animation, enjoy the reading! Now Kids, Percy the Piglet will show you the world of math! Martin the Mantis has skillful hands. He can make all sorts of furniture. Martin wants to give his mom a big present for her upcoming birthday. Everyone, even the star in the sky came down to help, but the size of the gift didn’t seem right! What should they do? Presented by Tinman Arts, a team profoundly experienced in children book publishing! Expertise and quality guaranteed! Interesting interactions to fully utilize the new media functions of the ebook. Touch anywhere on the screen and it might get you pleasantly surprised! Finely created animations interpret the stories in a cinematic way that brings excitement! Interactive sections specifically created according to the content of each book allowing practicing important concepts and ideas in children’s favorite way: games! Multilanguage supported with expert and authentic Chinese and English voice narration – perfect material for the children learning foreign languages! Compatible with iPad and iPhone 4. Retina display supported. Simply Touch the cartoon characters to interact with them. Intuitive operation with manual and automatic page turning. 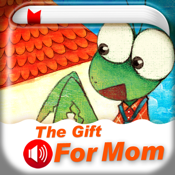 Sleep mode supported letting the children quietly fall sleep to soft music and lovely stories. Share though email and weibo. The latest iOS4.2 multitasking supported. Chengdu Tinman Technology Co, Ltd has devoted itself to developing applications of high-quality children’s animation books. Its subsidiary company, Chengdu Tinman Arts Co, Ltd is a creative team of many Chinese local artists. Established 6 years ago, the company has dedicated to developing and producing children’s picture books. The production range from pop-up books, picture books, mini-encyclopedias, educational toys, comics, etc. More than 300 productions have been made professionally for children. Your feedback and comments are highly welcomed and appreciated! Join in our VIP group on the QQ or follow us on our Weibo to get updated on the latest promotion and new book release! Before you make the purchase, please note that the current series is only compatible with iPad, iPhone4 and iPod Touch4. The series is not compatible with iPhone 3GS, iPhone 3G and iPhone first generation.